The multicolored thread in this ornament is Filomell, Gloriana’s overdyed Au Ver A Soie silk. This luscious thread is a delight to use. Named after a character in Spenser’s The Fairie Queene, Filomell is available in both softly shaded semi-solids and mulicolors. Being Au Ver a Soie, the base thread has seven strands. This makes it perfect for 13 or 14 mesh. On 18 mesh use three strands and diagonal stitches, or six stands and straight stitches. I used four strands for some of the piece pictured above and three in others, and I can’t tell the difference. Silk has a reputation of being difficult to use, but stranded silks like Filomell are almost as simple to use as cotton floss. While this thread won’t catch and snag the way filament silk does (threads like Trebizond or Silk Serica), you may find it easier to have your hands smooth before stitching. One of the things I really like about this thread is the line of colors. They all have a lovely softness that adds a pretty antique or vintage quality to your pieces. The semi-solids have a richness in their muted hues that will add instant class to any stitching. The multicolored shades are also muted even when they have many different colors in them, as this one did. That means they will play well with others. 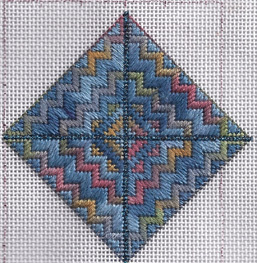 In my test piece, this thread, which has pink, gold, green, and gray in it, is combined with blue. And everything blends. Try them as the basis for a project and you’ll get some delightful, unexpected results. Gloriana’s threads are among my favorites. Those wanting some lovely hand-dyed threads to use should seek them out. If your shop doesn’t carry them, they can be ordered by your LNS through the maker. These threads were provided to me free of charge as part of Gloriana’s designer program and not for purposes of review. Janet. I love hearing about all the new threads out there. However, I am afraid the LNS in Houston (all 5 or 6 of them) don’t want to carry them and are not interested in ordering them for customers. Case in point: it took me three phone calls to locate #8 Pearl Cotton here in Houston. Two LNS don’t carry it at all. At the shop that carried Pearl Cotton, I asked for DMC Etoile, because I would like to do Debbie Rowley’s Xmas ornament. I was told I could probably find it at Hobby Lobby or Michaels. I will try to do that. I will also make finding threads the topic for tomorrow’s blog post.